With breathtaking views of sugar white sands and some of the world’s most beautiful beach vistas, you’ll pass through an eclectic collection of beach communities, each with its own personality and flavor. There are no big boxes, chains or billboards in these parts. Everything is unique, coastal chic … very cool, super sophisticated and totally fun. What you will find are nature trails, state parks, rare coastal dune lakes, art galleries, boutique shopping and some of the best food you’ve ever eaten in your life. If you’re feeling especially athletic, a paved sidewalk stretches the entire length of 30A. Join the beach cruisers, serious cyclists, leisure walkers, runners and kick bikers. You can also camp, kayak, saltwater and freshwater fish, hike and paddleboard your way through the bays, lakes and Gulf. In fact, this is the birthplace of YOLO paddle boards. This town center is home to restaurants, activities and shops galore. Must Eat: The Perfect Pig says “Praise the Lard,” and we couldn’t agree more. The parmesan cheese crusted breakfast sandwich with bacon, egg and cheese will make you squeal with delight. Must Shop: 30A Store shares the pride of place this coastal corridor celebrates. Once you get 30A sand between your toes, there’s no going back. 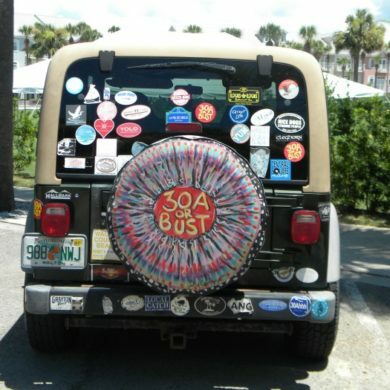 Commemorate your stay with some official 30A gear. The highest point anywhere along the Gulf of Mexico, at a whopping elevation of 64 feet. Must Shop: For the Health of It is a neighborhood organic grocery store and juice bar also offering massage therapy and supplements. Must Eat: On the other end of the dietary spectrum (and across the street from For the Health of It) is Johnny McTighe’s Irish Pub, your neighborhood dive bar and local’s hangout serving casual lunch and dinner. Whatever you order, add tots! With an unofficial slogan of “Nice Dogs, Strange People,” Grayton Beach is one of the oldest beach communities along 30A, surrounded by the nearly 2,000 acre Grayton Beach State Park. Must Shop: The Zoo Gallery traces its origins back to the early 70s, purveying a cool selection of jewelry, artwork, clothing, furniture and unique finds. Must Eat: A 30A icon, Red Bar is the spot for great food and live music. They keep it simple with funky decor and chalkboard menus. It’s cash only and you can expect a wait, so get there early. Sunday Funday is legendary. Bridges, boardwalks and a butterfly garden are cornerstones of this colorful community. Must Shop: Old Florida Outfitters is your one-stop shop for fine men’s and women’s outdoor apparel, with a complete selection of fishing tackle and gear. Built on 80 acres, Seaside is recognized worldwide as one of the iconic examples of New Urbanism design. It was also the primary filming location for the Jim Carrey feature film, The Truman Show. Must Eat: Bud & Alley’s is South Walton’s oldest restaurant and favorite gathering spot. Enjoy a cocktail on the roof deck bar, where sunset is celebrated every evening. Try the tuna dip and crab cakes in the main dining room, or hit the more casual Taco Bar or Pizza Bar. Must Shop: Perspicacity Open Air Market honors all things beachy and fabulous, with a wide assortment of bohemian apparel and accessories ranging from straw hats, French market totes, Havaiana flip flops, handmade jewelry, batik sarongs, colorful cotton kurtas and so much more. In the middle of it all, Seagrove is one of the oldest communities on this stretch, where families have visited since the 1940s. Must Eat: Cafe 30A serves excellent food, fabulous cocktails and an amazing wine list. Every Tuesday and Thursday is $5 ‘Tini Night in the bar. It’s a perfect special occasion spot. Must Shop: The Shops in Seagrove are located next to Whiskey Bravo near the corner of county Highway 395 and 30A. Housed in adorable cottages, they’re a treasure trove of handmade art. This is a true coastal village hometown, where lifestyle is everything. Must Eat and Shop: The Hub is located just outside of the Watersound gates. With seven eatery options to choose from, enjoy Happy Hour from 4 to 6 p.m. daily and live music for after-dinner dance parties. This is one of the more secluded spots along 30A. Must Eat: Crabby Steve’s Bay & Gulfside Restaurant is so tucked away, the only access is to walk up from the beach. It’s worth it, with a full bar, delicious food and spectacular Gulf views. Must Shop: At the beach and in need of a new suit? Shop Ophelia Swimwear for the latest in design and fit to suit any size or shape. Stunning architecture in stark white, home to fab restaurants and cool events. Must Eat: Caliza Restaurant is open seasonally for dinner, Tuesday through Saturday. For ambiance and atmosphere, this spot is a 12 on a scale of one to 10. Toast your troubles away during happy hour at the open air bar, then enjoy a poolside dinner of contemporary cuisine. Must Shop: The Alys Shoppe is a resort lifestyle boutique featuring a carefully curated collection of unique apparel, accessories and home decor. The store often hosts trunk shows, in-store events and opportunities for visitors to engage with designers and find out about their creations. This neo-traditional community is home to masterfully designed cottages, quaint shops and exceptional eateries. Must Eat: While wandering down the cobbled streets of Rosemary Beach, as you head towards the Gulf, La Crema Tapas and Chocolate is simply fantastic for all things chocolate. Wear loose clothing. But make sure it’s fabulous. Must Shop: Pish Posh Patchouli’s is the perfect boutique for a housewarming gift, birthday present or just a little happy for you from candles, makeup, soaps, sun care, hair care, sunglasses to signature scents. No matter where you stop, you’re sure to enjoy your special tour of this extra-special place.